I used to do regular monthly global surface temperature updates earlier this year, but I stopped a few months ago. I was getting bored with writing them and I noticed that readers weren’t reading them either. Also, Tamino and Sou do an excellent and timely job on this and I can add little to their commentary or figures. Nevertheless, I do update my graphs regularly for myself and I thought I would do one last post to wrap up the year, even if all of the data are not yet in. The GISTEMP November data are now out and reveal the second warmest anomaly ever for November, after 2015. La Niña failed to materialize in the latter part of this year and temperatures have not plunged as some people expected. A 2016 record warm year for GISTEMP is now assured. Here’s my crossplot for the year-to-date versus the annual averages, with a prediction for the full 2016 calendar year. 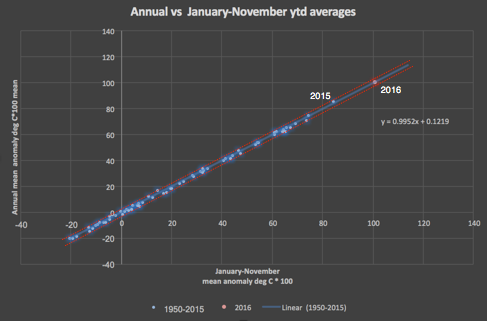 The red dotted lines bracket the historical variance for the first eleven months versus the whole year for all years back to 1950. According to this, the predicted year average will be 1.03°C, but it is likely to be a little lower since current monthly anomalies are running lower than the year-to-date average. It’s probably going to be 1.00°C or a hair above. No matter, it’s a clear record beyond the previous record of 0.86°C. That record was set in 2015. Here’s what the annual average history looks like now. The trend is now above the 1.0°C anomaly level relative to pre-industrial temperatures. The smoothed line shows remarkable linearity since 1980. 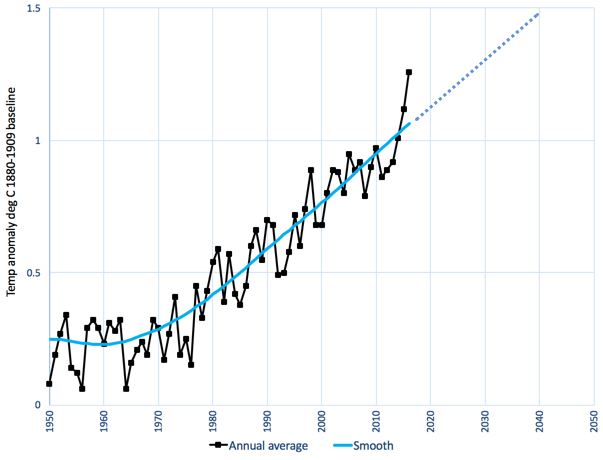 Simply extending this trend to 2050, as shown by the dotted line, suggests that the 1.5°C threshold will be reached in about 25 years. We are now already halfway to 2.0°C and two-thirds of the way to 1.5°C. Of course, abrupt changes in CO2 concentration trends (or trends in other forcing agents) could bend the temperature trend curve one way or the other. However, there’s a lot of physical and economic inertia in the system and it looks like—short of a major geo-engineering intervention—1.5°C is now baked in over the next two or three decades. The Met Office has a press release just out. A year ago, they predicted an anomaly of 0.84°C (±0.12) for 2016. For this year, January-October inclusive, they have observed 0.86°C (±0.10), so their prediction was very close. They say that 0.20°C of the 2016 average anomaly was caused by the El Niño that happened in the early months of the year. 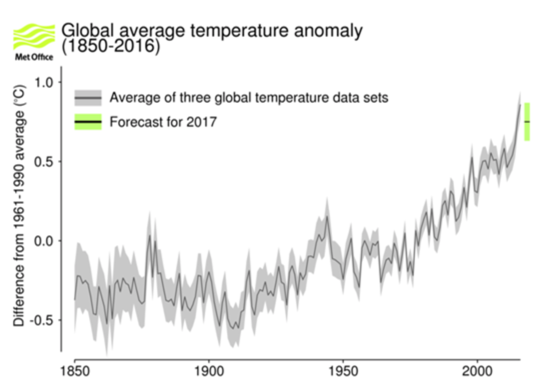 Here is a graph showing the averages of the HadCRUT.4.5.0.0, NASA GISTEMP and NOAAGlobalTemp plotted on a common baseline with uncertainties. The green bar on the right shows the Met Office forecast for 2017: 0.75°C (±0.12). This is substantially down on 2016, but will be close to 2015 and it should end up well above the current third-warmest year in the Met Office record, 2014, at 0.61°C. It will fall back closer to the long-term trend line. 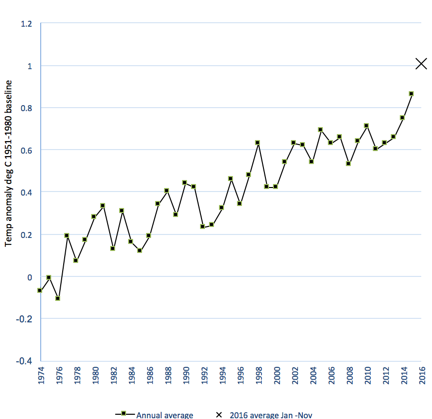 The five warmest years on record have been, in order, 2016, 2015, 2014, 2010 and 2005. Probably, 2017 will take third place unless something exceptional like an unforecasted La Niña forms or a big tropical volcano erupts. We are approaching the end of the warmest year ever recorded. And the temperature trend grinds on ever upwards. There has been no pause. But a serious, trend-ending pause is what we need to get going as soon as possible. Added: Here is a nice summary from Gavin Schmidt for the predicted (from late 2015) and the now likely values of the 2016 average GISTEMP anomalies. Also included is his forecast for 2017. Note that his baseline (1880-1899) is different from the one I used (1880-1909) and produces anomalies lower by about 0.026°C. As he notes, 2017 is likely to be above the 1 degree above pre-industrial level again. There might be the odd future year that falls below 1 degree, but most years will stay above that threshold, forever on human timescales. http://www.cpc.ncep.noaa.gov/products/analysis_monitoring/enso_advisory/ensodisc.shtml NOAA says La Nina has started – you say it failed to materialize…..
You are correct. I should have specified that a strong La Niña failed to materialize. Thanks. Clearly, conspiratorial liberals have been swapping out all the thermometers in the world in order to generate this data. No, that’s dumb… They’ve all just sold out their morals and the future of our species for that sweet, sweet grant money. Now I see the truth. Well actually, they have done some swapping of thermometers too, or at least moved them to areas filled with concrete, or rooftops and near heat generating equipment. Even worse they have deleted 2/3 of the cooler rural stations. Where there aren’t many thermometers in places like Africa and Siberia they simply make the data up, ignoring more accurate satellite data. This is nonsense. Provide respectable references if you want to have future comments accepted.